It’s that time of again where we release the survey results. 1187 people completed the survey, making our sample size 330 people larger than last time and 517 people larger than our first, so thanks everyone! Looks like the survey is growing and becoming more accurate as a result of more people outside GOL filling it in. In the long term, this is a great thing since it will give us a better data not limited to the readers of one site. However, in the short term, it does complicate things in terms of comparing previous data since the sample has changed. 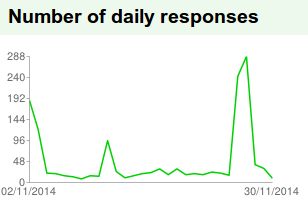 The survey has now taken a much more permanent form so we can observe trends over time. This time only two minor changes have been made in the form of changing the order of one of the questions and the tiers on the “how many games did you buy” question which caused some confusion - however these changes will not impact the ability to compare data over time and were simply done for clarity. Again, there was another “comments” type question which yielded a lot of junk responses, so this has been removed and there will no longer be any more questions which allow for ambiguous answers. Do you currently use Linux as your primary PC gaming platform? Did you exclusively buy Linux-supported games last month? Did you use Wine to play games last month? It is worth noting in this case that the number of people using Wine decreased by 3% compared to the previous results. Though this is a small number, it is larger than the other changes and could possibly mean the beginning of a trend where big games like CS:GO get ported and people stop using them through Wine. This question was tweaked slightly from the previous results in that all responses were grouped together to make the survey less intimidating and the data a bit more useful. Previously, the question had asked the percentage of those who did use Wine to say how often, but considering that the vast majority picked “more games native than on Wine”, it seemed like a pointless distinction. What was made clear with those previous questions however is that nowadays Wine seems to be something that people use for the one or two games which they play which haven’t been ported to Linux yet. Did you use a Windows partition for gaming last month? Again, this question was simplified in the same way as the Wine question. The percentage drop in people using Windows is around 2%, which could be within the margin of error. At the same time, these results are rounded and in fact could be closer to 3% than 2%, but given how awful I am at maths, I’ll leave that to someone in the comments section to work out the exact percentage. Like the previous question, this could be the beginning of a trend which we will only see over time. Did you delete your Windows partition or stop using it completely for gaming last month? This and the next question I have struggled with since they were introduced. Given that the Windows partition question is around a 2% change, this should be in the same region, but maybe a little bit higher since some people may have stopped using Windows months ago and only got round to deleting the partition now. If i had to theorise as to the discrepancy (partly based on evidence from the next question) I would say that there are many who deleted the partition months ago but are sad that they could not answer “yes” to this since there was no survey back then so are putting “yes” now in a subconscious desire to share their proud achievement with the world. So I may leave this question hoping that it gets more accurate after some time or eventually remove it if it stays the same. If you answered YES to the previous question, then please state why. With this question (part 2 of the previous question), it is impossible to pick out the real answers to those who deleted the partition months ago (apart from with a few obvious cases where it states “I haven’t used Windows for months”). But to give an idea of why people are moving away from Windows, the answers are often related to user experience (such as viruses, errors and just being a generally terrible OS), games being ported to Linux which renders the partition pointless and generally just making more room for Linux games! What distribution do you use on your primary Linux gaming PC? What Desktop Environment do you use on your primary Linux gaming PC? There were a few small shifts within the margin of error, however the big change here from the previous results is a 3% shift from Unity to KDE, making KDE the most widely used among the people surveyed. There could be a number of explanations for this, including the release of KDE 5 - which is pretty awesome, though still a bit buggy when I tried it a while back. This could also be indicative of people who made a switch to Linux a short time ago and went with the de-facto distribution of choice (vanilla Ubuntu) but are now becoming more adventurous and trying different things. Only time will tell. What I also note as quite interesting is that gamers clearly prefer more “traditional” desktop environments overall. Did you change your primary Linux gaming distribution last month? What graphics card do you use on your primary Linux gaming PC? Which drivers do you use for that graphics card? This is another case where I simplified the question which had been slightly erroneous given that it mentioned a PPA which made the assumption that the respondent was using a Debian-based distribution. The number of people using open source drivers is at a solid 20%, which is 2% higher than last time but this could again be a statistical issue caused by the growing number of outside respondents. It is worthy to note that the 2% “Don’t know” responses could include a majority of open source driver users since not knowing implies that no changes were made from the default drivers. What CPU do you use on your primary Linux gaming distribution? 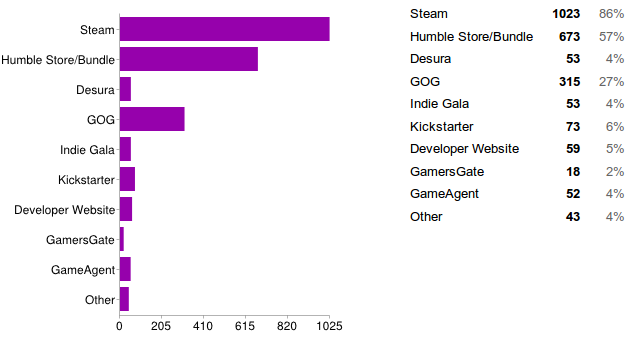 Which of these retailers did you use to buy your Linux games last month? How many Linux games did you buy last month? For the new survey (the one released today), I have changed the tiers since - as someone correctly pointed out - if you bought 2, 5 or 10 games, the answer was ambiguous. Overall, it can be said that less games were bought this month, which I would attribute to libraries getting filled up. The days where Humble Bundles would include 7 games which we didn’t have are sadly drawing to a close as things stabilise. Did you back any Linux-supporting crowdfunding games last month? This is a question I added for this survey which will stay in the new one. I don't really know what to make of the result since I didn't know what to expect, but I guess 11% of people backing at least one project is quite a high amount considering seeing similar numbers for Windows users seems completely improbable. So if anything, this does kind of confirm the "good will" nature of many Linux users which has also been observed in the higher Linux average for Humble Bundles for some time now. Unique question 1 - Have you bought Borderlands 2? It seems like an eternity ago now that Aspyr ported Borderlands 2, but this was the big release in October, so it made sense to have it as a unique question. The responses are overwhelmingly show that people have bought the game, with that 10% presumably holding out for a sale. Interestingly (based on active Steam users), if the same proportion of Windows users bought the game as Linux users (assuming this survey is an accurate representation of Linux gamers and not just GOL readers) then Borderlands 2 would have sold over 50 million copies, making it the highest selling PC game of all time. This is of course, completely meaningless, but an interesting thought nonetheless. Unique Question 2 - Are you using a 32-bit distribution as your primary gaming distribution? I expected 32-bit to be lower than 64, but not this low. It seems like only yesterday 32-bit was the defacto standard, with 64-bit being something you chose if you wanted to squeeze out a bit of extra performance at the cost of stability and support with certain applications, but times have certainly changed. This would suggest that if developers realised the incredibly low percentage of 32-bit users (and again, assuming this survey is completely indicative of Linux gamers) then devs would abandon 32-bit support altogether if they came across these stats since 3% of 1-2% doesn’t seem worth the effort at all. Of course, developers may well currently assume that there is a large percentage of 32-bit Linux users since this is the case for Windows. However, given the nature of the OS and its userbase, it does make sense that there would be an almost universal adoption of 64-bit significantly before it occurs with Windows. The survey is certainly moving forward, both in terms of perfecting the questions and the growing number of respondents. If the number of respondents stays stable above 1000 or continues to grow, then we will be able to observe trends on a monthly basis. It might be worth discussing how this should be done - one possibility could be continuing these articles as they are and having a separate bi-monthly or quarterly article which shows trends, or another could be simply having graphs every month with the new stats plotted in. Suggestions welcome! What I would like to avoid is for each individual question stating that there was a 1% increase or decrease every month because on its own, it seems completely meaningless and somewhat tedious. After a reddit post resulted in 300 extra responses in one day (see above), I would also like to examine the possibility of publishing links to the survey in more places to get more accurate data and also maybe bring more people to GOL who otherwise haven’t heard of it. Again, this is an area where I would appreciate suggestions, ideas and a bit of community involvement since I don’t even have Facebook and still fail to understand why Twitter exists - so obviously not the best person to bring the survey to a wider audience. The new Survey for December is available here - so please fill that in if you have the time. Great job! Good survey results for Linux gamers I think. Some interesting results, and good work! The unique question for December should have "about as much" as an option - that one would be most applicable for me. Very cool breakdown and analysis. Thanks! Tak The unique question for December should have "about as much" as an option - that one would be most applicable for me. Very true! Probably the same for me too actually. I've added it in now before more responses come in. Sorry to those who have already answered but didn't get the option. Very interesting. It would be nice if the results were sorted by percentage. I consider 2% a very low jitter considering the lot of new participants, and you surely don't need (or should) report all declines or raises of such a low percentage. You could try to promote this on the Steam forum for Linux. Perhaps not for the one for SteamOS, not sure. By the way, the result for 32 vs. 64 bit is very interesting. For example, the demo of Making History: Great War was not able to run on 64 bit at all and it seemed the developers were totally unaware of that possibility. If I would have had this result, I would have pointed them here. stan Very interesting. It would be nice if the results were sorted by percentage. Yup, I know, it's been bugging me quite a bit too. It's something I've been looking into and something that Liam commented on too. Basically, at the moment I just take screenshots of the graphs Google Forms generates, so that's the order they come in (which is also the order of the possible responses). I don't want to change the order of the possible responses, since some of them have a logical order, but what I can do is change the order of them after I take the form offline and have the results and (hopefully) that will change the order in the images too. Don't know if that made any sense... But yeah, next time they should be in the correct order! Eike By the way, the result for 32 vs. 64 bit is very interesting. For example, the demo of Making History: Great War was not able to run on 64 bit at all and it seemed the developers were totally unaware of that possibility. If I would have had this result, I would have pointed them here. The Witcher 2 is not a Wine wrapper.